I had lots of apples and carrots in the fridge during the snowstorm. Fresh, raw fruits and veggies keep the body healthy! I also bought lemon curd recently on a whim. But I had no idea what to do with it. I’d never heard of it, to tell the truth. I mean, LEMON CURD? Sounds like someone milked a lemon-flavored cow. How’d the cow get lemon-flavored? It ate exclusively Lemonheads, of course. Enter the power of the internet: it means that you can throw all of these things together in a Google search box, and come out with something delicious. So I found a recipe for Apple Carrot Salad with Huckleberry Lemon Curd, and I modified it slightly (because really, who has huckleberry lemon curd?!) to suit my own purposes. Voilà! A delicious, dessert-like salad that stunned and impressed my roommates. Also suggested for decadent brunches and as a healthy, tasty party side dish. Wash, core and quarter apples – but do NOT peel. Slice apple into 1/4 inch pieces. Shred or thinly chop carrots. 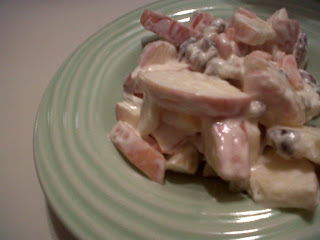 In large bowl, toss together sliced apples, carrots, walnuts and Craisins. In separate bowl, blend Cool Whip and lemon curd. Gently mix lemon curd blend with other ingredients until everything is evenly coated. Garnish with carrot curls if desired. Cover and chill until ready to serve. so, let me know if one of your roomies does something to get themselves evicted, 'kay? Sounds delicious. I almost bought a jar of lemon curd once, but had no idea what to do with it, so passed. I super appreciate your resourcefullness. I do that kind of things lots of times. A couple months ago I discovered how easy apple crumble was when trying to use up some apples. I can't do nuts but the rest of this does sound like a great way to work some healthy food into something delicious. oh, bummer. almost would have wintered the storm just to have had some of this. Homemade lemon curd is the most amazing treat, especially in the dead of winter. It goes deliciously with vanilla ice cream. Here's the recipe I use. It creates the most amazing sweet to sour ratio. Great recipe! Assuming that lemon curd is the same as what we have here, I spread it on toast, it is sometimes called lemon butter. We also have a variation with passionfruit added to the mix. Thanks for the great recipe!